These two table ends were probably part of the three-piece dining table. The set would have included a center table section with two drop leaves supported by swing legs. These two table ends were probably part of the three-piece dining table. The set would have included a center table section with two drop leaves supported by swing legs. The linear edges of the two table ends have mortises or tenons that would have engaged mortises and tenons on the edges of the center section’s drop leaves. When fully extended, the table could seat probably twelve or more diners. When not being used for dining purposes the table ends could be placed against a wall and the center section left in the middle of the room with leaves dropped to conserve space. These table ends have gently tapered legs and single-board tops of solid cherry. The rails are laminated pine with cherry veneer. 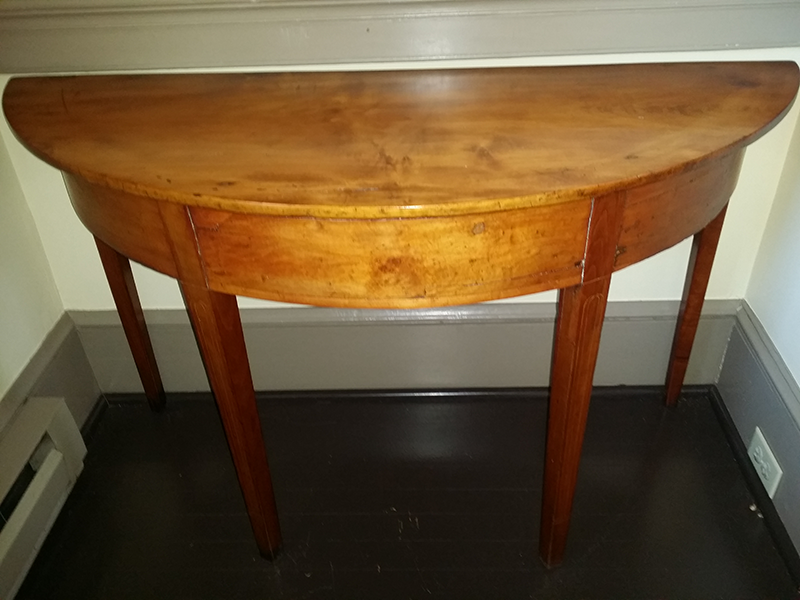 There is no ornamentation on the table except for the two outer legs that have vertical string inlay terminating at a single, horizontally inlayed line about five inches off the floor. The table tops are attached to the frames with screws set in wells. The linear sides of the tables have inner and outer rails joined with rose-head nails and tenoned into the corner legs. Shadows suggest that glue blocks provided additional support where the front and rear rails meet. The front legs are bridle-joined to the four-board, horizontally laminated rails. A medial bracket is dovetailed to the front and inner rear rails. Overall, the table is 49 1/2 inches wide, 19 inches deep and 28 1/2 inches tall. The tables have been refinished and additional screws have been added to secure the tops to the rails. A front leg of one table was been damaged and repaired. Corner glue blocks are missing. The top of one table was severely damaged at some point so it was inverted and reattached to the frame. The shadow of the frame is still visible on the “new top” as are filled screw holes. “Top Turned 1936” is written on the underside of this table.